OMAHA, NEB. 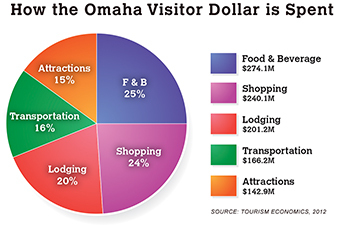 - New economic impact research conducted by Tourism Economics shows more people are visiting Omaha and spending more in our city than ever before. In 2012, research shows 11.4 million visitors spent $1.025 billion dollars, a 13% spending increase in two years. 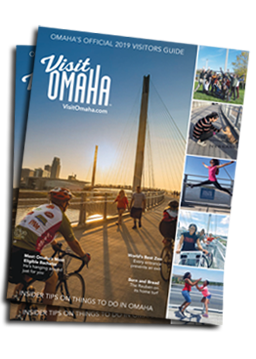 "This research shows tourism in Omaha is growing and providing economic benefits for our city and tax relief for our citizens," said Dana Markel, executive director of the Omaha Convention and Visitors Bureau. "When visitors eat in our restaurants, stay in our hotels and shop in our stores, they are bringing new money into our local economy." The new research shows visitor spending saves each Douglas County household approximately $655 a year in taxes. In addition, tourism supports 16,200 jobs in the city, that&apos;s more than the number of employees at ConAgra, Mutual of Omaha and Union Pacific combined.